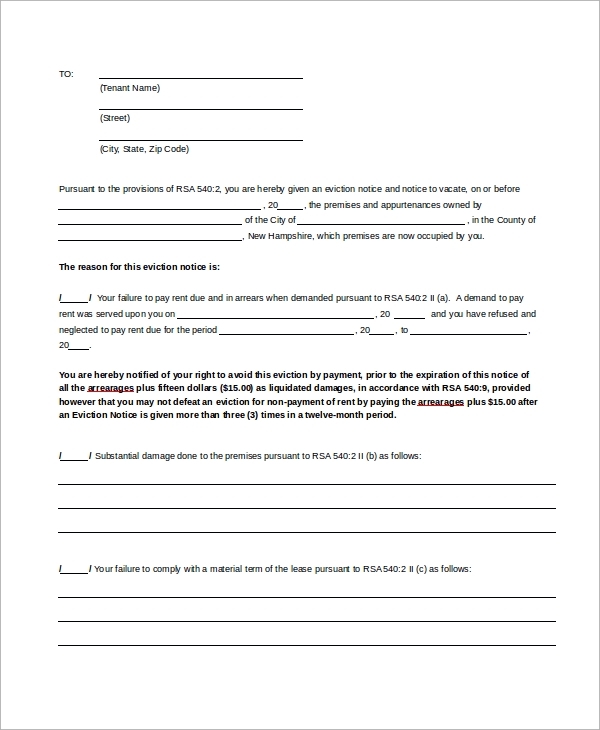 It is a collection of nearly 20 forms of eviction that a landlord can send to the tenant based on different grounds such as for nonpayment, a complaint from neighbors, failure to maintain premises clean, breaking the terms and conditions of the agreement, damages to the property and so many other reasons. 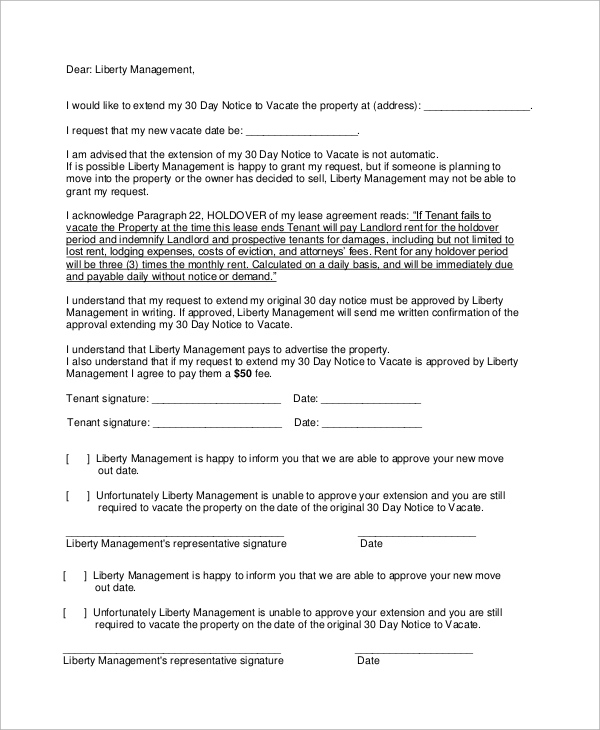 30 Day Notice to Vacate is a form that the landlord or legal representative has to fill to provide a 30-day timeframe for the tenant to vacate the property. It mentions the duration, the reason for such notice and the future course of action if it is not vacated in the given period. 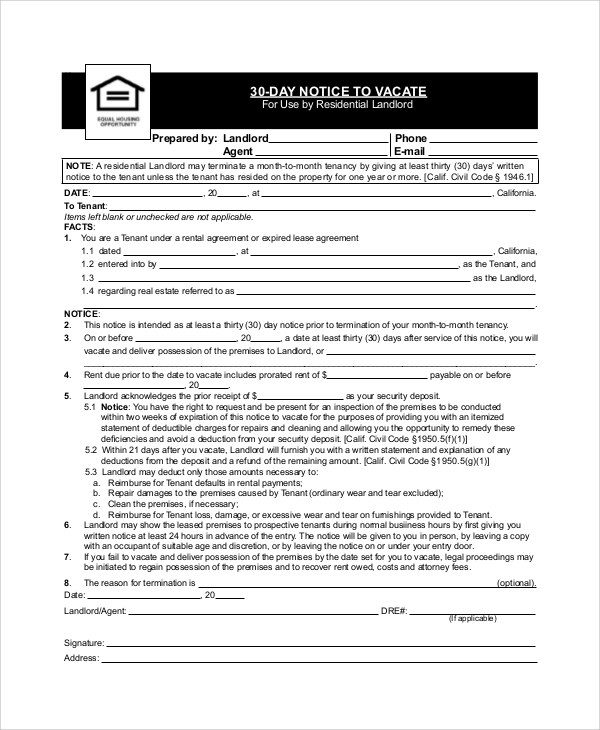 This is a perfect format to send a 30 day Eviction Notice Form to the tenant. It has provisions to write the details about the property, specifies the important date, clearly explains the reason of eviction notice, mentions the damages and monetary fine that one may have to pay and what could be the future steps with not evicted in 30 days. 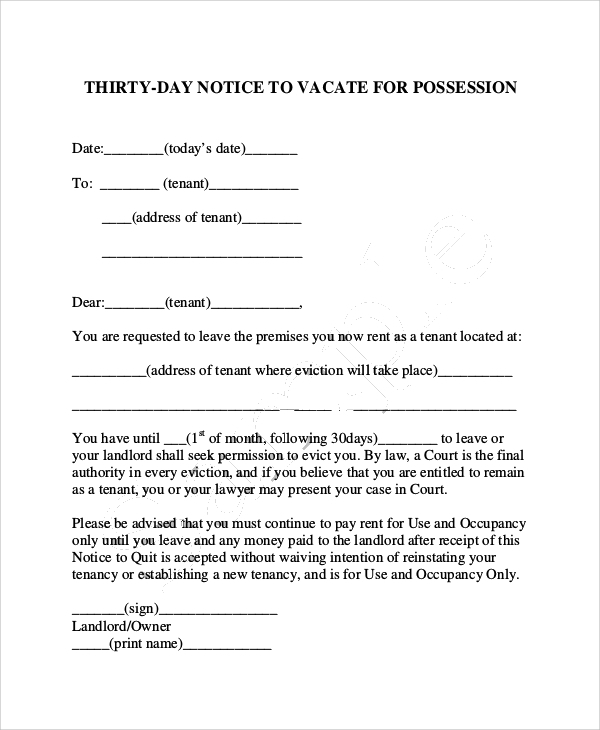 30 days Eviction Notice Samples are the first formality whereby a landlord furnishes it to the tenant to give him 30 day time to vacate the land and it clearly explains the reason for such step. If the tenant denies complying, the landlord can take any legal step and he can also mention the same in the notice so that the tenant knows what is coming and he can do everything not to face that. Different reasons for eviction notice require different types of eviction notices and all of them are listed above and they are made by professionals to cover all necessary provision to protect the interest of the landlord. 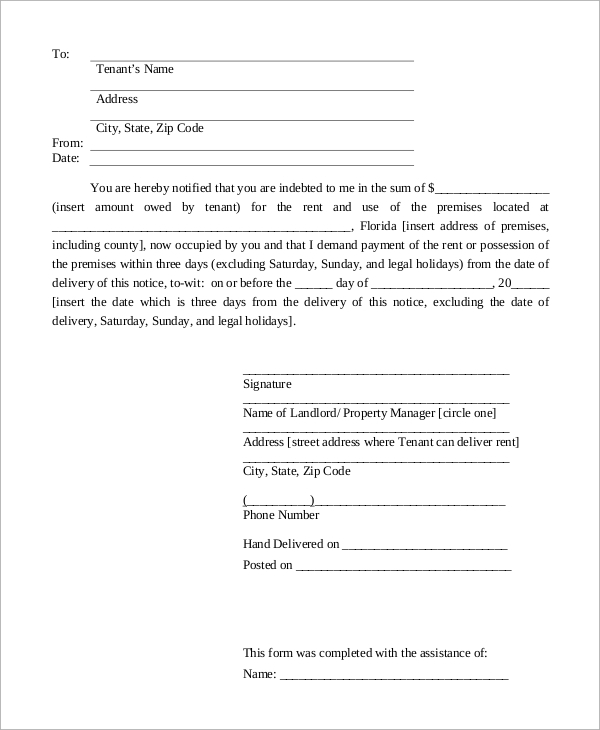 It is a general eviction notice to the tenant for 30 days, and it is sent when a tenant is occupying a property even after his contract has expired and he refused to renew it. In the notice, the duration is mentioned along with what could be the future set of actions legally. 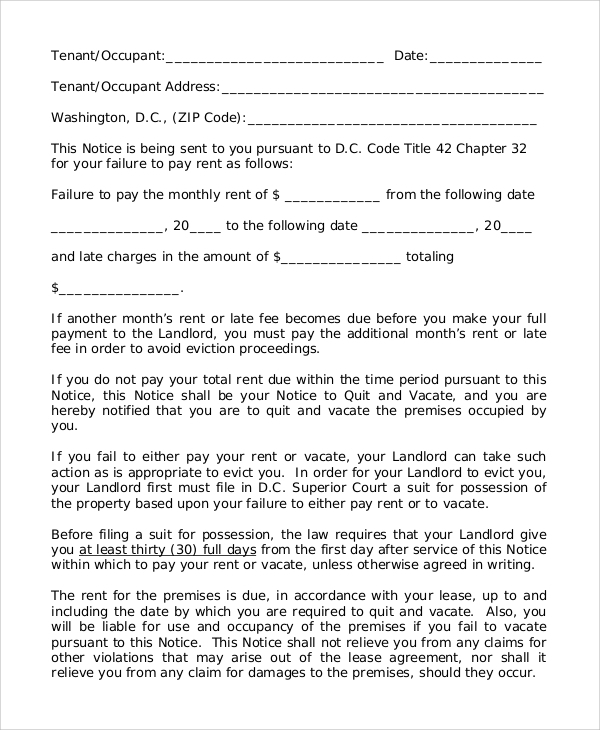 This is complete eviction notice for 30 days, and it is for a residential landlord to furnish to the tenant. It mentions the period, the terms and conditions are broken, acknowledgment from the landlord to return security money and other legal procedures as soon as the tenant vacates the mentioned property. That targeted audiences of the 30 day Sample Eviction Notice are the landlords who want to get rid of their tenants when the tenants break the mentioned terms and condition in the contract or due to some unforeseen circumstances such as a complaint from neighbors and likewise. They are also useful for the landlord representative and property dealers and agents who can take action on behalf of the landlord and he/she can have the power of attorney to do so. 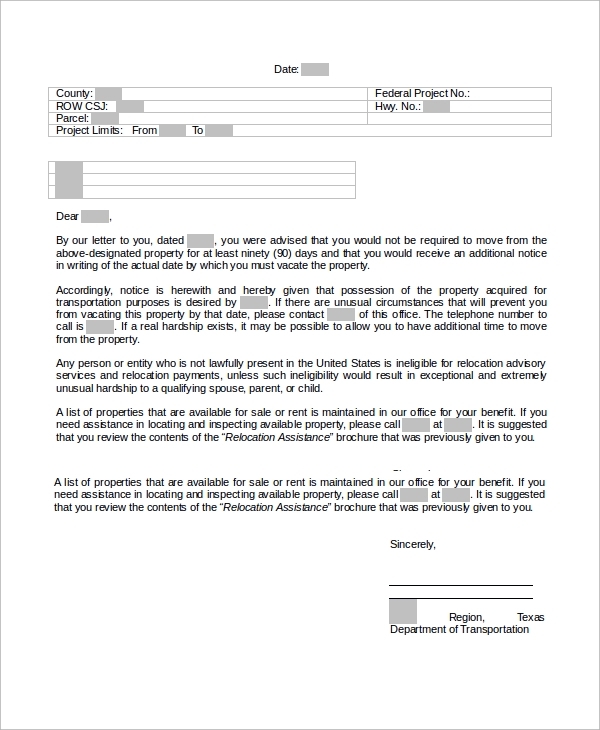 The above-listed 30 days Sample Notice Letters are perfect, and they cater to different conditions for eviction such as for violation of terms and conditions in the contract, refusal to leave the property after expiry of contract or damages to the property and likewise. Different scenarios require different types of legal 30 day Eviction Notice.